When you’re ready to go BIG, we’ve got you covered! At Victor Printing, we offer a wide range of large format printing services that can accommodate your large format requirements. With high-quality resolution, vibrant colors and durable materials, you can count on Victor Printing’s expert, large format printing capabilities. 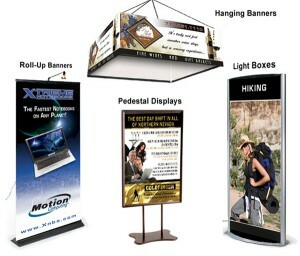 We can print banners up to 63″ wide and ANY length. The flexibility of our printing allows you to print a single large poster or accommodate a larger run. We print on a wide range of materials that can accommodate short and mid-term, outdoor use. Our print experts and our world-class customer service is available to help your project be a print-success! Click here for a custom price quote. Looking for a way to take your message to new heights? 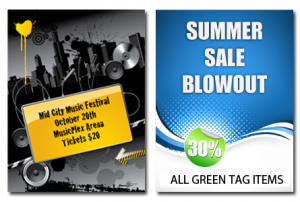 Go BIG and bold with full-color vinyl banners! No matter which custom vinyl banner material you select, we use state-of-the-art large-format printing presses, so you get a high-quality banner that stands out in a crowd. Window space is a great advertising opportunity. Custom window clings are an attractive and practical method for capitalizing on window space. Share your message with the world. Window decals come in a variety of standard formats and we are able to produce custom decals to fit your requirements. Mounted on the back of the glass, so the design is seen through the glass. Additionally, window clings can be temporary or permanent, depending on your needs. 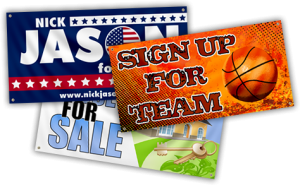 From home for sale to landscape advertisements, yard signs get your message out to all those passing by. 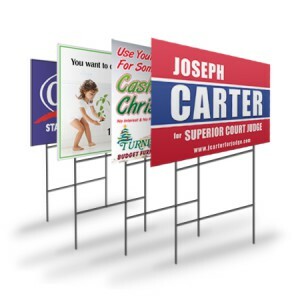 Yard signs can be used for many different occasions. Because they are double sided, you can be sure your message will be seen coming and going. « Get Your Design Ready for PRINT!